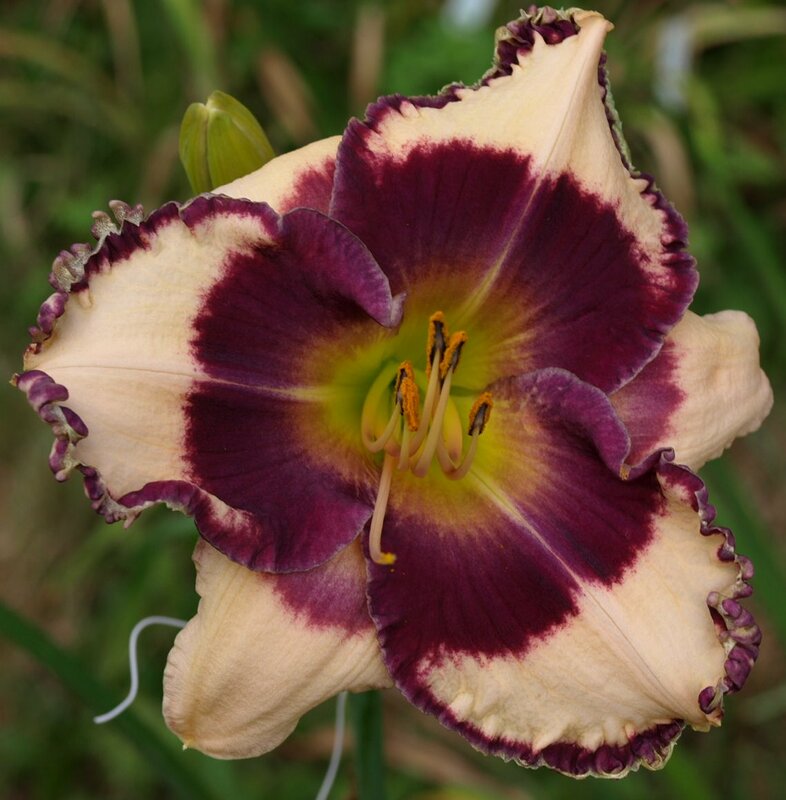 (Megan Skinner, registered 2010, introduced 2011) H33” W6.25” Early Re Dor Tet, bloom nocturnal and extended, EMO and CMO. Seedling A24 (FRAGRANT NIGHT X GREEN MYSTIQUE), 25 buds on 3-way branching, very fragrant. Easily fertile both ways. Reblooms. Clear yellow self with cream midrib and green throat, and outstanding substance; EARLYBIRD BUTTER SCULPTURE has ruffled petals, grooves, and a sculptural pleat on each petal. In appearance, it is clearly a GREEN MYSTIQUE child, but it inherited its durable northern plant habit from Roy Woodhall’s excellent FRAGRANT NIGHT. 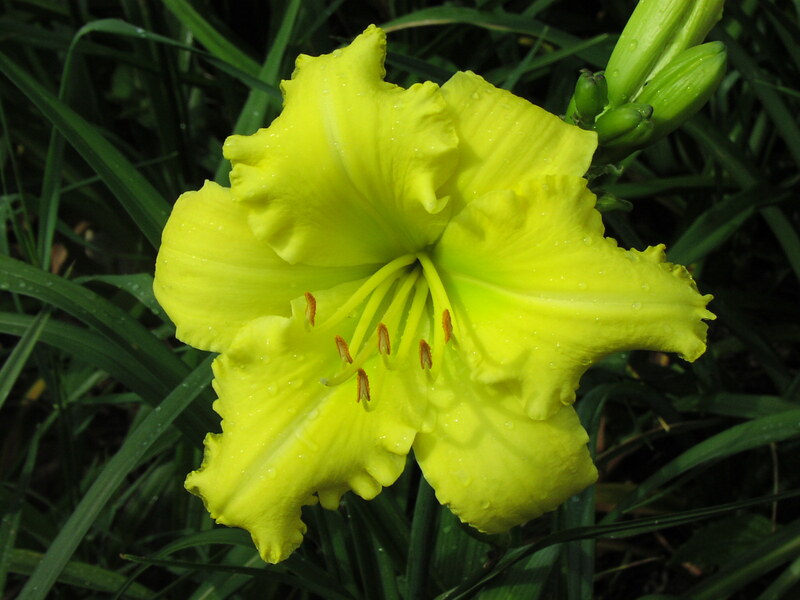 In short, it is a modern-looking large-sized daylily which begins blooming with STELLA D’ORO. Fantastic parent, and passes its sculptural pleating to its progeny. (Megan Skinner, registered 2010, intro 2011) H35” W6” Early Re Dor Tet, bloom nocturnal and extended, 35 buds on 3-way branching, fragrant.. EMO and CMO. Seedling A-14 (EARLYBIRD LEMON-LIME PARFAIT X ORCHID BLUSH). Fertile both ways. Reblooms. At last, a large-flowered clear pink northern dormant in the early bloom season! 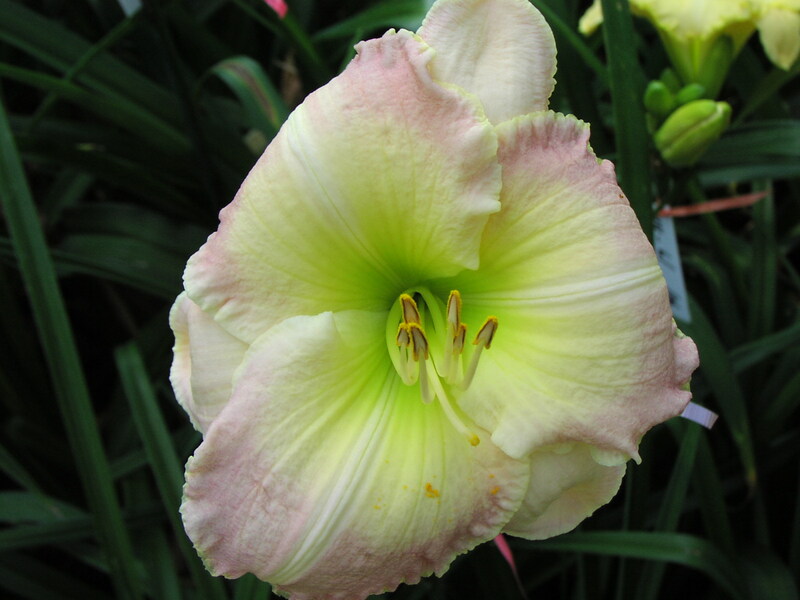 EARLYBIRD ROSALEE PINK has baby-pink petals with huge light-cream eye and cream midribs over large lime throat. The bitone sepals are a more pale cream-pink. Both petals and sepals are edged with lemon-cream. A lovely garden flower and a fantastic parent for early and early-early seedlings in the pink, rose, and cream family. (Ron Skinner, registered 2010, intro 2011) H31” W6.25” Midseason Sev Tet, Seedling T01-014 [(SHADOW DANCE x (MOKAN BUTTERFLY x (MOKAN BUTTERFLY x LUPINE))) X MILDRED MITCHELL], fragrant, bud count 18 on 3-way branching. Pod fertile and I think pollen fertile. HONESTY COMPELS ME is hard to describe. It has light raspberry petals, a darker raspberry pencil edge, a white midrib and sepal edges, green throat, and a double petal edge, which includes dark raspberry and gold. Then there’s describing the color of the watermark. 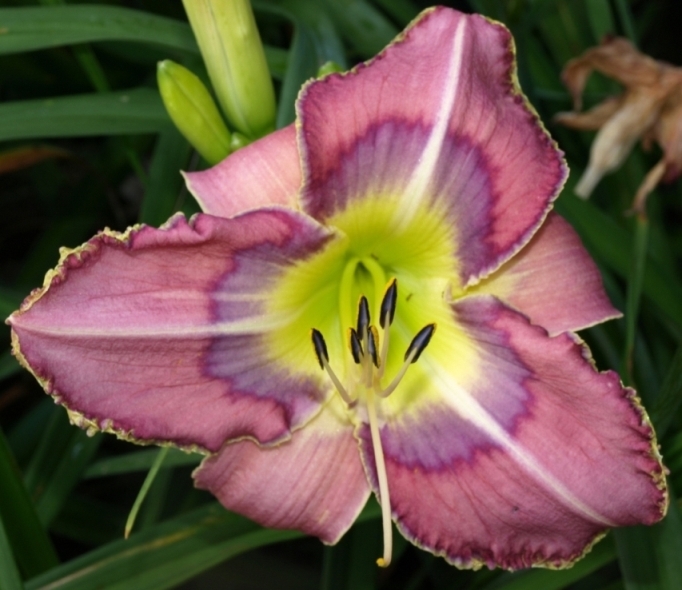 HONESTY COMPELS ME to admit that the slate blue shown in the eye and lower portion of the double edge pales to mere lavender in comparison to the almost true blue of some of the southern-bred daylilies that I grow. The color is bluer on cool mornings, but reverts to slate lavender in heat. It’s vigorous and northern hardy, and a very fine garden daylily. (Ron Skinner, registered 2010, intro 2011) H35” W5.25” Midseason Dor Tet. Seedling T02-030 (MOKAN BUTTERFLY X ISLESWORTH). 23 buds on 3-way branching, CMO, fragrant, fertile both ways. Ivory petals set off the plum eye, which has a wide orange base radiating into the plum zone, all over a green throat. The petals are edged with a mixture of plum and silver. The silver is diamond dusted, and actually does have a metallic glimmer. The name “Newfoundland Pirate” comes from a family legend that Megan’s several-times-great-grandfather, who was definitely a cod fisherman who lived in Brigus, Newfoundland, was also a pirate. After two centuries, who knows? Her second cousin once removed loves handing out pirate hats at family parties. Whatever. What’s sure is that the daylily NEWFOUNDLAND PIRATE is hardy, vigorous, a great clumper, and an attractive garden plant. (Megan Skinner, registered 2010, intro 2011) H29” W4.875” Mid-late SEv Tet. Seedling A161 (SHERRY LANE CARR X DIVINE COMEDY). 21 buds on 3-way branching, fragrant, fertile both ways. SUMMER SMILES is just that – a flower that stops everybody in the garden and makes them a bit happier. It wasn’t even a planned-out program cross – just one that “seemed like a good idea that morning”. It’s so much fun to live with! 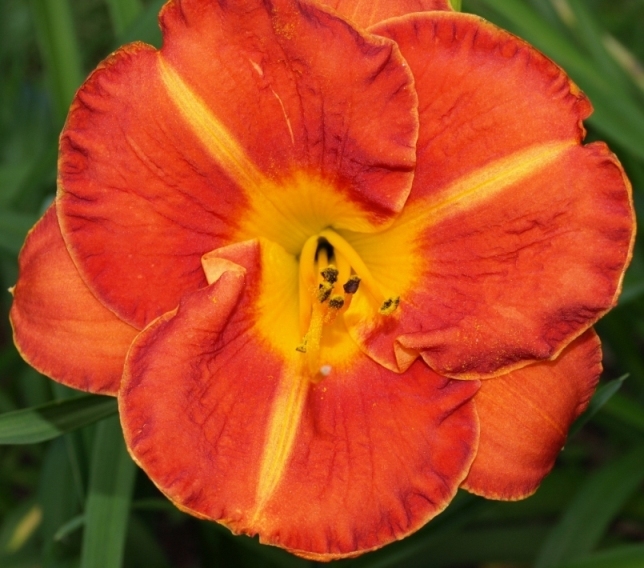 Petals are wider than they are long (about 3 1/3”), and the bright red-orange flower is highlighted by wide yellow-gold mid-ribs extending from the yellow-gold throat, and thin yellow-gold edges. Very vigorous plant, and good pod-setter.